US sports broadcaster ESPN has decided to close down its dedicated 3D channel by the end of this year due to a lack of uptake, ending a three-year run for the channel. Disney-owned ESPN added that it plans to commit its 3D resources into other products and services that will better serve its customers and affiliates, and indicated that this could include 4K television, also known as Ultra High-Definition. 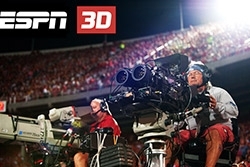 ESPN 3D costs around US$ 2.79 per month (depending on the pay-TV operator), which places it among the most expensive premium channels in the country, according to research by SNL Kagan. With sports coverage expected by most observers to be the biggest driver for take-up of 3D television, this decision represents a major setback for the technology in the world’s most developed TV market.